We are seeking new members for our team for 2015. If you or anyone you know know may be interested, please visit our careers page for more information. All three vacancies are UK based. Closing date for applications is 9 January with interviews starting on 12 January. 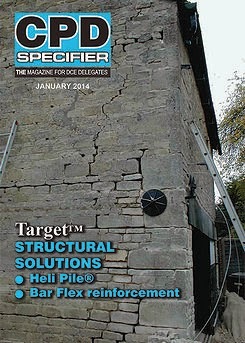 Last year, Target Fixings and Target Structural, the specialists in repairing cracked masonry, travelled the country with Direct Contact Exhibitions (DCE) delivering continuing professional development (CPD) seminars. In addition, many clients who were unable to attend the DCE shows contacted Target individually to request bespoke events. Target is pleased to announce that it will be continuing to provide bespoke CPD seminars for clients who request them in 2015. For the bespoke CPD seminars, Target can cater for audiences of between 5 and 100 and this can either be hosted either at the client's offices or another location. The seminar will primarily focus on the Bar Flex masonry reinforcement system and the Heli Pile foundation system, but can also be tailored to the client's requirements. Clients who are interested in a seminar should contact Target directly. Clients with fewer than 4 attendees, should watch this space in the new year when Target will be announcing further information on nationwide events that it will be providing for multiple clients. Target Fixings, the systems manufacturer, and Target Structural, its contracting arm, have recently carried out an 'Elastic Masonry' test which is part of wider testing programme of Target products. This testing programme includes Bar Flex helical masonry reinforcement and Heli Pile foundation system. 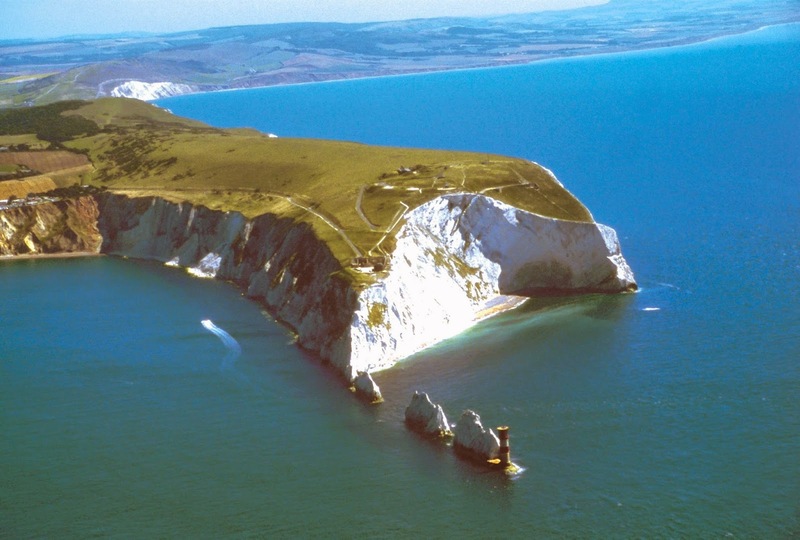 Target Fixings will be presenting at a technical breakfast seminar, organised by Target Structural, the exclusive installation company for the Isle of Wight. This seminar is taking place at the Innovation Centre, St. Cross Business Park, Newport, PO30 5WB on 29th October 2014. A free breakfast is provided from 8:30am with the seminar due to start at 9:00am and is expected to last around one and a half hours. The seminar is aimed towards enhancing attendees' technical knowledge and there will also be the opportunity to speak to Target Structural's installation team. We announced at the beginning of this year that in 2014 we were to be exhibiting across the country with Direct Contact Exhibitions. We have six locations booked in for September 2014. Repair, Refurb, Retrofit takes place on 9 September at Quality Hotel in Boldon, Sunderland and is free for all to attend (register now to ensure you have a free lunch!). We are doing a presentation on Subsidence and Masonry Cracking at 11:30am, but will be at the hotel from before 8:30am should you have anything you wish to discuss with our team. Repair, Refurb, Retrofit takes place on 10 September at Village Hotel Leeds at Headingley, Leeds and is free for all to attend (register now to ensure you have a free lunch!). We are doing a presentation on Subsidence and Masonry Cracking at 1:00pm, but will be at the hotel from before 8:30am should you have anything you wish to discuss with our team. NE Lancs Buildingex takes place on 11 September at Mercure Foxfields Country Hotel at Billington, Blackburn and is free for all to attend (register now to ensure you have a free lunch!). We are doing a presentation on Subsidence and Masonry Cracking at 11:30am, but will be at the hotel from before 8:30am should you have anything you wish to discuss with our team. Essexbuild takes place on 16 September at Park Inn Harlow in Harlow, Essex and is free for all to attend (register now to ensure you have a free lunch!). We are doing a presentation on Subsidence and Masonry Cracking at 11:30am, but will be at the hotel from before 8:30am should you have anything you wish to discuss with our team. Bucksbuild takes place on 17 September at Snozone Milton Keynes in Milton Keynes and is free for all to attend (register now to ensure you have a free lunch!). We are doing a presentation on Subsidence and Masonry Cracking at 11:30am, but will be at the hotel from before 8:30am should you have anything you wish to discuss with our team. W Mids Buildingex takes place on 18 September at Park Inn Birmingham West in West Bromwich and is free for all to attend (register now to ensure you have a free lunch!). We are doing a presentation on Subsidence and Masonry Cracking at 11:30am, but will be at the hotel from before 8:30am should you have anything you wish to discuss with our team. Furness Abbey was founded in 1123 by Stephen, Count of Boulogne (later King of England), on the northern outskirts of Barrow-in-Furness, Cumbria. It was originally a house for the monastic Congregation of Savigny, but later became famous as the second most powerful Cistercian monastry in the country. The abbey is built entirely of sandstone and was enlarged in the 12th and 13th centuries and it is from this building phase that much of the ruins come from remain today. In the 15th century, the western tower was built and also still survives to a good height, providing some of the intricate design work that must have been employed during its construction. Furness Abbey now lies in ruins, after being ordered to be destroyed by Henry VIII in 1537. Despite this, it has been visited by a number of famous people including painter J M W Turner and a young Theodore Roosevelt. The abbey even prompted William Wordsworth to write a poem, At Furness Abbey , following numerous visits there. In modern times, the abbey has been subjected to some media attention, with Channel 4 reporting on a grave that revealed the first crozier (a staff with a crook on top) to be excavated in over 50 years. In addition to this, an impressive gemstone ring was also uncovered, and both have been on display at Furness Abbey since April 2014. The abbey itself is undergoing emergency conservation work by English Heritage to stop it sinking into the ground. It was originally built on huge oak foundations, which have started to give way after 500 years. Target Fixings was contacted as part of these repairs as there was concern over the possibility of some of the stones moving or falling from the openings during the underpinning repairs. In 2012, Target surveyed the site with a view to assisting English Heritage with identifying potential problems and assisting with the method of repair. A comprehensive report was produced, recommending the use of several of Target's standard repair methods working together. In 2014, Target Structural was given the green light for the project, and spent three days on site installing Bar Flex and Cem Flex to provide a hidden repair, so as not to spoil the beauty of one of the UK's most historic buildings. We are pleased to announce that we will be adding another date to our events calendar this month when we exhibit at buildeng South West 2014 on 30 April. Hosted by The Chartered Association of Building Engineers, this event is the 3rd annual conference for construction professionals and also incorporates a comprehensive trade exhibition. It is at Haynes International Motor Museum in Sparkford, Somerset. Doors open at 8:30am when coffee will be available. Conference runs from 9:45am until 4:00pm. The entrance fee is £49+VAT per delegate, or four places can be booked for the price of three. The full programme can be found on the Chartered Association of Building Engineers events page, or you can contact Amanda Bayes (Email: amanda.bayes@cbuilde.com, Telephone: 01604 404121) for more information. Information on this event, including the above image, has been gathered from The Chartered Association of Building Engineers website, which can be found at http://www.cbuilde.com/. Recreation of this article is strictly prohibited. 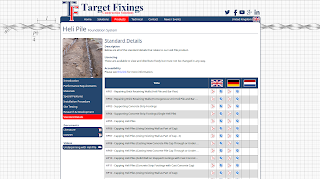 Our sister company in the Netherlands, Target Fixings BV, has released the first non-English version of the new Target Fixings website. Target Fixings BV has a new website! Back in January, we announced that our new website would soon launch in other languages, and the Dutch version is now fully complete for our friends in the Netherlands. More languages will be released soon. 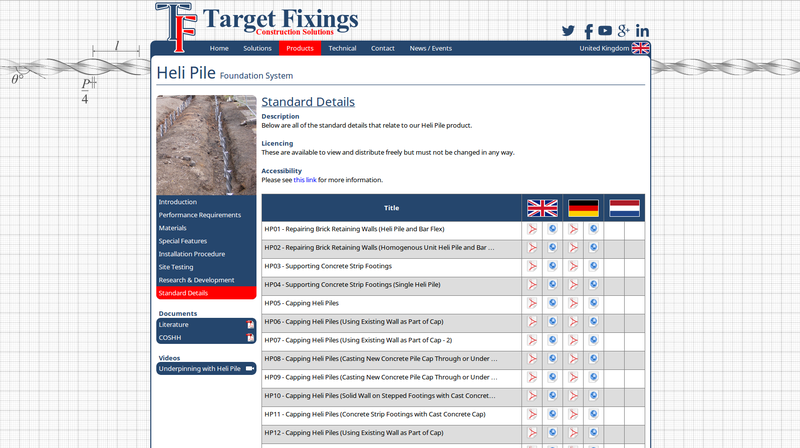 If you are a Dutch speaker, please head over to http://www.targetfixings.nl/ and keep in contact with Target there. Alternatively, you can switch between languages on our website by simply clicking the flag in the top-right-hand corner of the page and then choosing your preferred country. Despite the UK flooding hampering a lot of site work this month, February has still seen things very busy at Target. 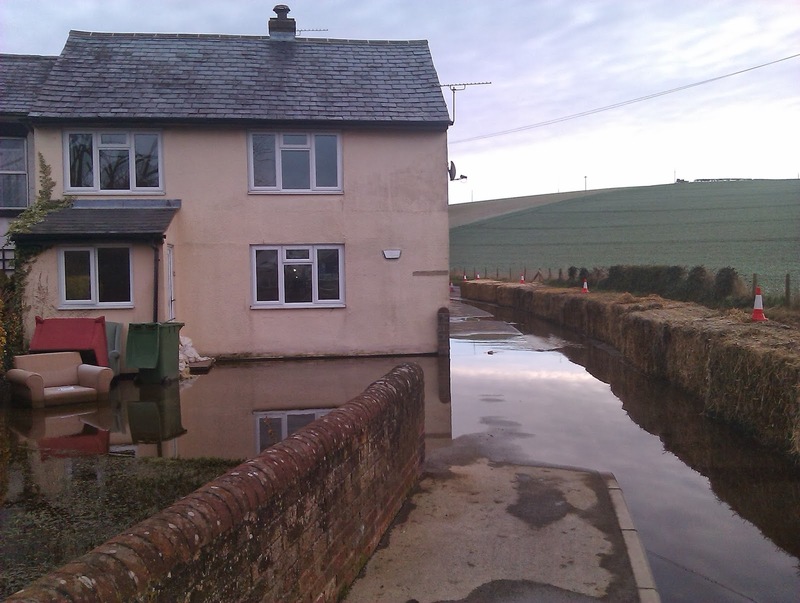 After our New Year move, we have fully settled into our new offices near Newbury and despite our office being in the Thames Valley area, we have been fortunate enough to avoid the flooding. In addition to this, supplies of structural products from our factory have been unaffected by the weather. 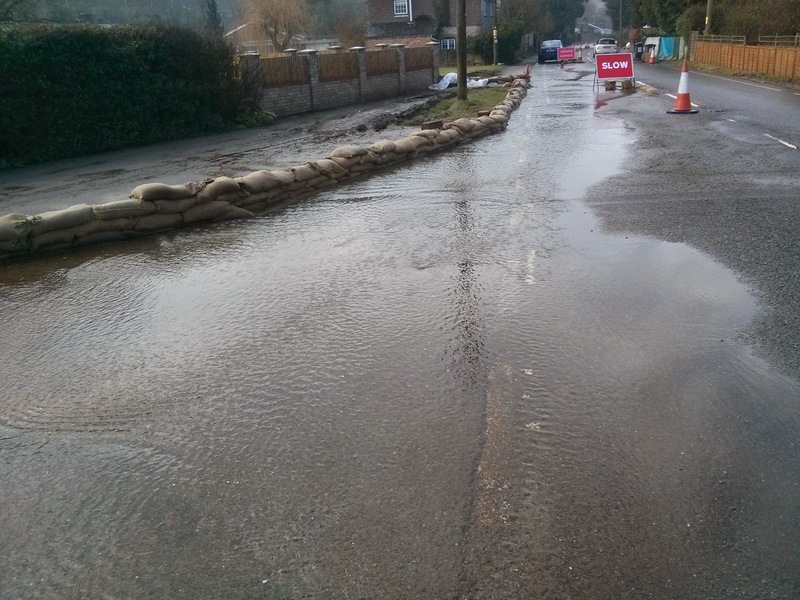 Away from the Thames Valley area, Target was able to witness more flooding first-hand as the DCE exhibitions passed through Somerset into Cornwall and Devon at the start of the month. As Target is often called out to assess structural damage caused by flooding, we regularly sees the traumatic effects of flooding and our thoughts are with all of those who have been affected. The shows in the West Country were followed up by a trip to Bristol for Avonbuild and then two further shows in Nottingham and Waterloo at the end of the month. All of the shows were very well attended and we would like to thank all of those who did attend. If you were unable to attend, please see our events map for more shows, or contact us if you would like to arrange for Target to perform a private CPD seminar for your organisation. The only public exhibition we are attending next month is Hantsbuild in Southampton on 13 March - we look forward to seeing you there! Below is a transcript from an article written in CPD Specifier magazine, which is exclusively available for all DCE delegates. You can download the full article here. Although established in 1997, Target Fixings' personnel have been involved in specifying and supplying masonry repair solutions since 1989. Target now manufactures a number of well known products including Heli Pile®, Bar Flex and Bond Flex that have been used in many intriguing situations. As a manufacturer, Target has built all of the bespoke machinery for the complete manufacturing process. The installation tools are also manufactured in house to exacting standards - including milling, heat treating and lathe work of raw materials. Target is unique, being able to perform a structural survey, specify its manufactured products and then install those products through its Target Structural brand. The name Target is synonymous with quality products, excellent service and common sense advice for building professionals and home-owners alike. We announced at the beginning of this year that in 2014 we were to be exhibiting across the country with Direct Contact Exhibitions. We have three locations booked in for July 2014. Bedsbuild takes place on 1 July at Luton Town FC in Luton and is free for all to attend (register now to ensure you have a free lunch!). We are doing a presentation on Subsidence and Masonry Cracking at 11:30am, but will be at the hotel from before 8:30am should you have anything you wish to discuss with our team. Northants Buildingex takes place on 2 July at Nene Whitewater Centre in Northampton and is free for all to attend (register now to ensure you have a free lunch!). We are doing a presentation on Subsidence and Masonry Cracking at 11:30am, but will be at the hotel from before 8:30am should you have anything you wish to discuss with our team. Shropsbuild takes place on 3 July at Lord Hill Hotel in Shrewsbury and is free for all to attend (register now to ensure you have a free lunch!). We are doing a presentation on Subsidence and Masonry Cracking at 11:30am, but will be at the hotel from before 8:30am should you have anything you wish to discuss with our team. We look forward to seeing you at the events. Don't forget you can mark the dates in your diary at our Facebook or Google+ pages. We have nine locations booked in for June 2014. W Midlands Buildingex takes place on 3 June at Roman Way Hotel in Cannock, Staffordshire and is free for all to attend (register now to ensure you have a free lunch!). We are doing a presentation on Subsidence and Masonry Cracking at 10:30am, but will be at the hotel from before 8:30am should you have anything you wish to discuss with our team. Peak District Buildingex takes place on 5 June at Chesterfield FC in Chesterfield and is free for all to attend (register now to ensure you have a free lunch!). We are doing a presentation on Subsidence and Masonry Cracking at 10:30am, but will be at the hotel from before 8:30am should you have anything you wish to discuss with our team. N East Buildingex takes place on 10 June at Newcastle Falcons in Newcastle-Upon-Tyne and is free for all to attend (register now to ensure you have a free lunch!). We are doing a presentation on Subsidence and Masonry Cracking at 11:30am, but will be at the hotel from before 8:30am should you have anything you wish to discuss with our team. Cleveland Buildingex takes place on 11 June at BW Parkmore Hotel & Leisure Club in Stockton-Upon-Tees and is free for all to attend (register now to ensure you have a free lunch!). We are doing a presentation on Subsidence and Masonry Cracking at 11:30am, but will be at the hotel from before 8:30am should you have anything you wish to discuss with our team. N Lincs Buildingex takes place on 12 June at Scunthorpe United FC at Scunthorpe and is free for all to attend (register now to ensure you have a free lunch!). We are doing a presentation on Subsidence and Masonry Cracking at 10:30am, but will be at the hotel from before 8:30am should you have anything you wish to discuss with our team. Manxbuild takes place on 17 June at Palace Hotel & Casino in Douglas, Isle of Man and is free for all to attend (register now to ensure you have a free lunch!). We are doing a presentation on Subsidence and Masonry Cracking at 11:30am, but will be at the hotel from before 8:30am should you have anything you wish to discuss with our team. Kentbuild takes place on 24 June at Best Western in Bromley, Kent and is free for all to attend (register now to ensure you have a free lunch!). We are doing a presentation on Subsidence and Masonry Cracking at 11:30am, but will be at the hotel from before 8:30am should you have anything you wish to discuss with our team. Waterloo Buildingex takes place on 25 June at The Union Jack Club in London and is free for all to attend (register now to ensure you have a free lunch!). We are doing a presentation on Subsidence and Masonry Cracking at 11:30am, but will be at the hotel from before 8:30am should you have anything you wish to discuss with our team. 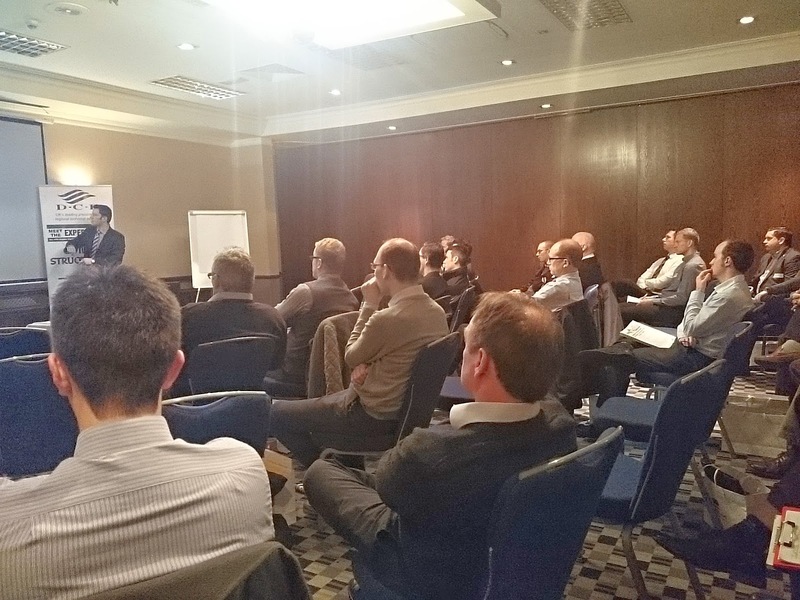 S London Buildingex takes place on 26 June at Holiday Inn Kingston South in Surbiton and is free for all to attend (register now to ensure you have a free lunch!). We are doing a presentation on Subsidence and Masonry Cracking at 10:30am, but will be at the hotel from before 8:30am should you have anything you wish to discuss with our team. January's events are now behind us and we would like to thank all those that made an appearance at the three exhibitions in the Midlands and North West of England. We visited Birmingham, Manchester and Liverpool this month as our team travelled North and West to exhibit with Direct Contact Exhibitions at their one day events. We even used the opportunity to visit Scotland to give a private presentation to a company based in Glasgow. Following its trial run earlier in the month during a private CPD seminar for a company in Devon, our stand made its public debut, showcasing the change in branding that Target has undergone in the past month. As is customary with these events, the days began with a bacon butty breakfast before casual discussions with delegates from local councils and other attending parties such as building surveyors and architects. At each venue we gave a seminar that can be used as part of Continuing Professional Development, which helps people to take in new knowledge to ensure competence in practice. There were some very interesting questions that we are working on building into our presentations in the future. Between seminars and during the free lunch, we were able to discuss in more depth specific projects that delegates had, answering more questions on a personal one-to-one basis - our preferred method of discussion. 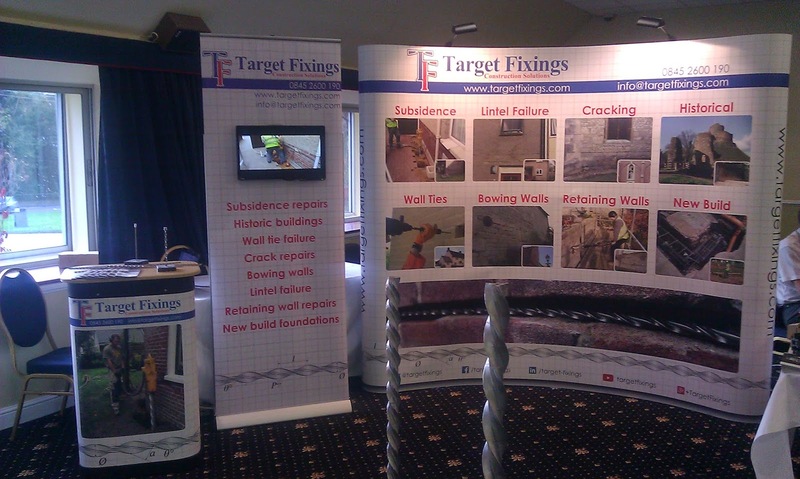 We were very pleased with the footfall at the exhibitions and we look forward to working with attendees in the future. If you weren't able to attend these events, we will be returning to the North West with DCE in September and November, or you can arrange a free CPD seminar for your company by getting in touch. If you have any further enquiries, please do not hesitate to contact us by phone or using the online form. We attended three shows in January. We have five locations booked in for May 2014. Surreybuild takes place on 13 May at The Hallmark Hotel in Croydon, Surrey and is free for all to attend (register now to ensure you have a free lunch!). We are doing a presentation on Subsidence and Masonry Cracking at 1:00pm, but will be at the hotel from before 8:30am should you have anything you wish to discuss with our team. SE London Buildingex takes place on 14 May at Millwall FC in London and is free for all to attend (register now to ensure you have a free lunch!). We are doing a presentation on Subsidence and Masonry Cracking at 11:30am, but will be at the hotel from before 8:30am should you have anything you wish to discuss with our team. NW London Buildingex takes place on 15 May at Bridge Hotel in Greenford, London and is free for all to attend (register now to ensure you have a free lunch!). We are doing a presentation on Subsidence and Masonry Cracking at 11:30am, but will be at the hotel from before 8:30am should you have anything you wish to discuss with our team. Vectisbuild takes place on 20 May at Newport FC in Isle of Wight and is free for all to attend (register now to ensure you have a free lunch!). We are doing a presentation on Subsidence and Masonry Cracking at 1:00pm, but will be at the hotel from before 8:30am should you have anything you wish to discuss with our team. Sussexbuild takes place on 21 May at Hollingbury Park Golf Club in Brighton and is free for all to attend (register now to ensure you have a free lunch!). We are doing a presentation on Subsidence and Masonry Cracking at 11:30am, but will be at the hotel from before 8:30am should you have anything you wish to discuss with our team. We have one exhibition booked in April 2014. Lake District Buildingex takes place on 3 April at Penrith Rugby Club in Penrith, Cumbria and is free for all to attend (register now to ensure you have a free lunch!). We are doing a presentation on Subsidence and Masonry Cracking at 11:30am, but will be at the hotel from before 8:30am should you have anything you wish to discuss with our team. We have one location booked in for March 2014. Hantsbuild takes place on 13 March at Novotel in Southampton and is free for all to attend (register now to ensure you have a free lunch!). We are doing a presentation on Subsidence and Masonry Cracking at 9:30am, but will be at the hotel from before 8:30am should you have anything you wish to discuss with our team. We look forward to seeing you at the event. Don't forget you can mark the dates in your diary at our Facebook or Google+ pages. Back at the start of November we promised that changes were coming - and here they are! The changes follow a large re-branding on the company to bring it forward into 2014 and beyond and the design emulates our aims in business by providing a cleaner and more modern solution. Our logo is now more modern to fit in with contemporary design techniques, but still retains the heritage font of the previous gold nut version that was there from our founding. The colouring follows years of gradual change from green and gold, through blue and gold and now blue and red. Our new colours will filter through to our literature and other paperwork in the coming months. In the top-right of the screen you will see a flag indicating that you are on the UK version of the website. We are aiming to roll out the new website in German, Dutch and Czech soon in order to aid our Dutch company, Target Fixings BV. This will enable our clients abroad to have easier access to information on our products while on the continent. Also accessible from that corner of the screen are the links to social media. Our news will be automatically published to Facebook, Twitter and Google+ while our latest videos will also be posted on YouTube. For those that love RSS feeds, our news is also available there too. It is our aim to be far more proactive on these sites than we have been in the past, including keeping everyone up to date with the latest projects and innovations that we have been involved in. We hope you can spare a moment to keep in touch with us if you use any of those platforms. As you can probably tell, we have also upgraded our news section. 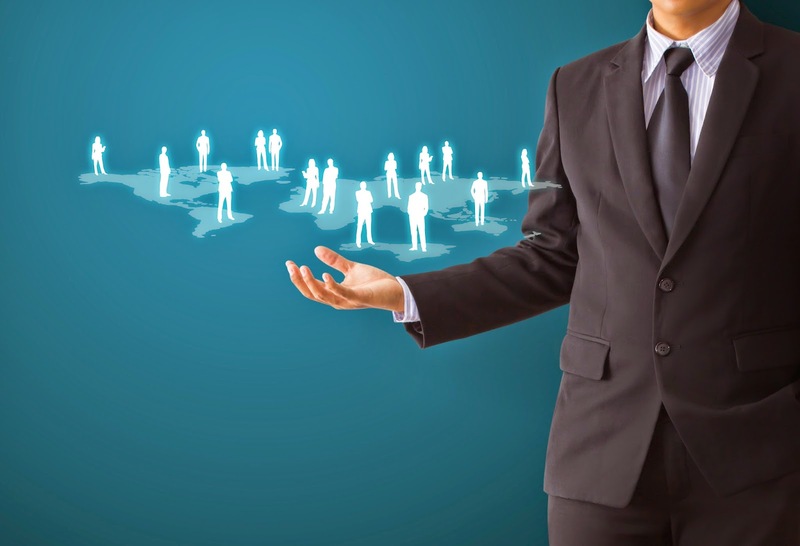 In the past it was up to one person to post news to the website whereas we are now using a platform that enables many members of the team to keep in touch from the various activities around the company. As always though, our products and technical advice are still the main focus and we still supply our products with the same fantastic service you should expect of us. As always, everything we supply comes with next day carriage as standard if it is in stock. While you can still contact us to get immediate technical advice, you are still able to browse the product information from exactly the same links you have been using before. We are also in the process of translating our Standard Details into five different languages to help our colleagues and customers overseas. We have completely revamped our solutions page to provide an interactive house which will show our most popular fixes for common masonry problems, and our case studies page no longer requires you to download anything - everything you need is on-screen. We haven't forgotten eXtensions, either. We have now made over 200 off-site modular buildings and are starting to build more disability units available for rent or purchase. The new website for eXtensions is still undergoing development hasn't yet been updated. We aim to roll this out over the coming months and enquiries for eXtensions should be directed to our main contact page. Finally, we still have many more developments that we can't wait to share with you - this is just the beginning of a new and exciting period at Target. We have five locations booked in for February 2014. Cornish Buildingex takes place on 4 February at Penventon Park Hotel in Redruth, Cornwall and is free for all to attend (register now to ensure you have a free lunch!). We are doing a presentation on Subsidence and Masonry Cracking at 9:30am, but will be at the hotel from before 8:30am should you have anything you wish to discuss with our team. Devonbuild takes place on 5 February at The New Continental in Plymouth and is free for all to attend (register now to ensure you have a free lunch!). We are doing a presentation on Subsidence and Masonry Cracking at 1:00pm, but will be at the hotel from before 8:30am should you have anything you wish to discuss with our team. Avonbuild takes place on 6 February at The Aztec Hotel in Bristol and is free for all to attend (register now to ensure you have a free lunch!). We are doing a presentation on Subidence and Masonry Cracking at 9:30am, but will be at the hotel until past 12:30pm should you have anything you wish to discuss with our team. East Mids Buildingex takes place on 25 February at Novotel in Longeaton, Nottingham and is free for all to attend (register now to ensure you have a free lunch!). We are doing a presentation on Subsidence and Masonry Cracking at 11:30am, but will be at the hotel from before 8:30am should you have anything you wish to discuss with our team. Repair, Refurb, Restore & Retrofit takes place on 26 February at The Union Jack Club & Waterloo Conference Centre in London and is free for all to attend (register now to ensure you have a free lunch!). 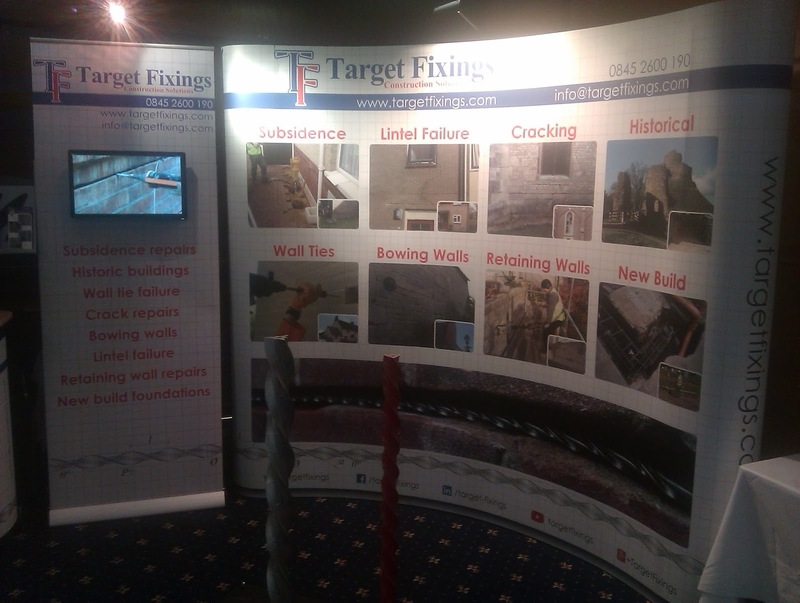 We are doing a presentation on Subsidence and Masonry Cracking at 10:30am, but will be at the hotel until past 12:30pm should you have anything you wish to discuss with our team. During 2014, we are going to tour the country with Direct Contact Exhibitions (DCE) and will be exhibiting at over 40 shows throughout the UK. DCE has been hosting exhibitions since 1987 and has a reputation for connecting professionals throughout the UK and Ireland. Their exhibitions tend to be reasonably focussed occasions and this gives exhibitors the chance to talk to most of the attendees to discuss particular problems in their area. Target has been exhibiting at DCE for a number of years, but this year we are doing more shows than ever, offering a opportunity to talk face-to-face with our team about any of our products and get free technical advice with any structural problems you come across. We are more than happy to arrange site visits should you think a problem is too complicated for drawings. As well as talking to clients and delegates, we will be doing Continuing Professional Development (CPD) networking seminars at the exhibitions which we attend, which are completely free of charge. By pre-registering for the event, you are also eligible for a free lunch, provided by the exhibitors. The DCEs that we will be attending will be listed on the left-hand-side of this page, arranged in date order and we will be releasing more dates soon. You can also find a map of all of the DCEs on this news site. Put the closest DCE into your diary and we look forward to seeing you there. As our team will be out and about on the road in their tour of the UK, there is an opportunity to arrange a CPD seminar for your company or organisation. We are more than happy to come into your offices and do a small presentation to introduce our products and how they solve certain masonry problems that you may come across in your day-to-day work. 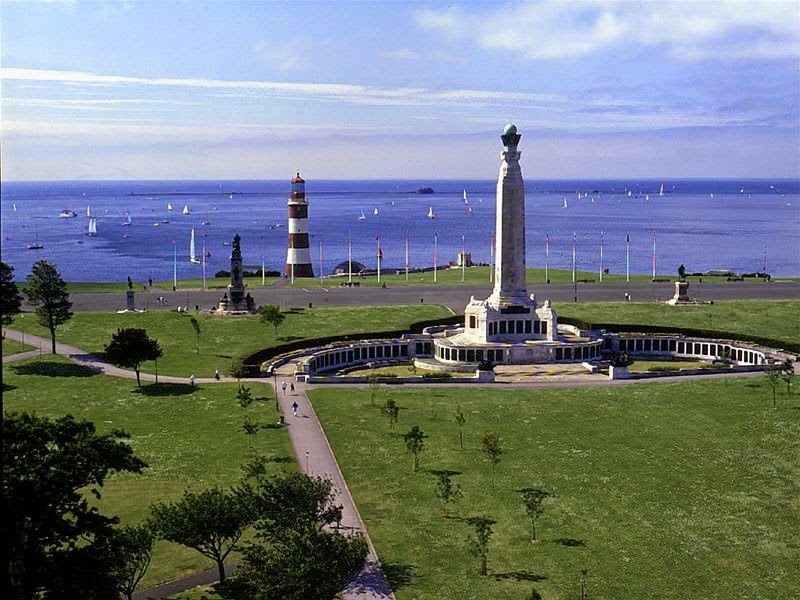 Please contact us by telephone where one of our team will be able to help you arrange a convenient time and location. We have three locations booked in for January 2014. West Midlands Buildingex takes place on 23 January at Strathallan Hotel in Edgbaston, Birmingham and is free for all to attend (register now to ensure you have a free lunch!). We are doing a presentation on Subsidence and Masonry Cracking at 11:30am, but will be at the hotel from before 8:30am should you have anything you wish to discuss with our team. Cheshirebuild takes place on 28 January at Holiday Inn Manchester Airport in Wilmslow, Manchester and is free for all to attend (register now to ensure you have a free lunch!). We are doing a presentation on Subsidence and Masonry Cracking at 11:30am, but will be at the hotel from before 8:30am should you have anything you wish to discuss with our team. Merseybuild takes place on 30 January at Goodison Park in Liverpool and is free for all to attend (register now to ensure you have a free lunch!). We are doing a presentation on Subsidence and Masonry Cracking at 8:30am, but will be at the hotel until past 12:00pm should you have anything you wish to discuss with our team. 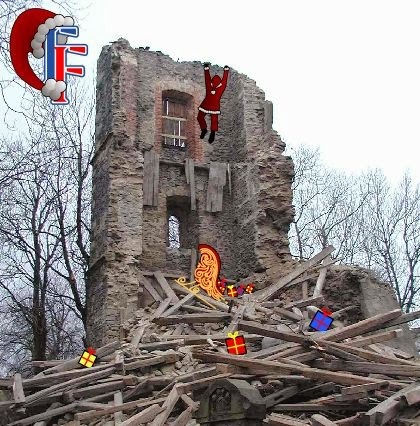 We hope you had a good Christmas and New Year - whatever you were doing. We were spending our two weeks off moving offices. We're now located in a convenient location just two miles from the M4 and A34, providing fast links in all directions across the South of England. More information and a map can be found on the Contact page.